The Constitution Society is an independent, non-party educational foundation which works to promote informed debate about constitutional reform. We take no position on specific reform proposals but advocate better legislative standards and oppose ill-considered, piecemeal change. There has recently been a revival of interest in the idea of establishing a UK citizens' convention. It would allow members of the public, possibly working with politicians, to deliberate about constitutional issues and make recommendations. There are a variety of different models that could be adopted for this purpose. 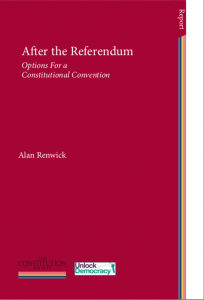 In 2014, The Constitution Society published a pamphlet by Alan Renwick which provided an overview of the options.